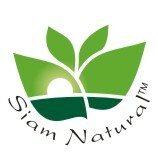 Siam Natural  brand are regenerative herbal compound products cultivated by Thai growers association members & purveyors of Kwao Krua Kao, Kwao Krua Dang, Mangkhut, Makhom pom, Chi Wu Cha, Fak Khaao, & numerous other unique native Thai rainforest herbal health compounds and natural skin care nutriment oils. People all over the world are now rediscovering unprocessed herbs, oils, and plant botanicals in a resurgence of natural health care awareness & modalities used prior to the industrial revolution wherein everything became tainted with additives, chemicals, and heat processing - now known to destroy and even obliterate all the natural minerals and nutrients contained in raw plant botanical compounds. 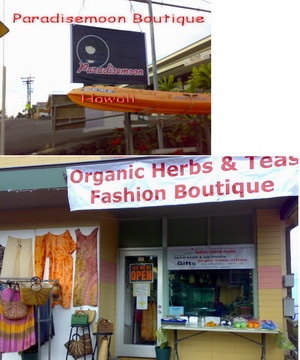 We stock some of the worlds rarest treasured natural holistic herbal botanical compounds from Thailand - encapsulated in Veggie-caps, holistic spa & massage compounds, and Asian specialty skin & beauty oils & natural hair care products! "Health is a a state of complete physical, mental, and social well being and not merely absence of disease or infirmity"
According to modern science adaptogens are natural plant products that increase the body's ability to cope with internal and external stress factors, and normalize the functions of the body. They help maintain the stable internal environment inside the body known as homeostasis. A very important characteristic is that these are ancient Asian herbs time tested to be 100% safe with no side effects. Red Holy basil contains ursolic acid and is being touted as one of the cosmetic industrys latest favorites because it improves the skins elasticity and combats wrinkles. 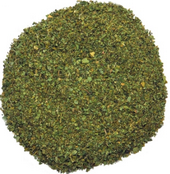 Adaptogenic herbs can be most useful in the quest for health in our stressful society. David Winston and Steven Maimes explain and champion the use and benefits of these important herbs." Super stress reducing Siam Natural  Adaptogen-III, anti aging, endocrine system support botanicals Chi Wu Cha root, Red Holy Basil leaf, Amlaki fruit powder (Radic Eleutherococci, Ocimum sanctum, Emblica myrobalan) are also useful in cancer prevention (free-radical scavenging), Allergies, Auto-immune disorders, Diabetes, Skin rashes/allergies, Chronic Rhinitis, & Chronic Sinusitis. Adaptogen-III natural herbal compounds are essential botanical tools used in top holistic health spas around the world that can also be self-administered for natural skin care and anti-aging without manufactured chemical based corporate products. "Stress" is the main enemy of healthy skin and a balanced system! Siam Natural Adaptogen-III Chi Wu Cha, Holy Basil, Amlaki, is an endocrine system balancing stress reduction herbal powder supplement. Superb energizer and tonic for internal & extranal applications. Holistic health entails balancing the mind, body and spirit. The three compounds in Adaptogen-III have centuries of successful use in the far east (TCM) and India, Ayurveda). These untreated natural plant [botanical] nutriments & phytochemical compounds have been known to be useful for a number of stress related ailments and used as rejuvenative and regenerative anti-aging & antioxidant supplements to promote weight loss, prevent cancers, reduce high blood pressure and lower the risk of heart disease. The three compounds in Adaptogen-III embrace traditional holistic herbal spa massage practices and are effective when applied externally as a paste (body mask/face mask) to stimulate blood circulation, to exfoliate, nourish and encourage the growth of new skin, and relax the body. Simply mix a small amount of the blended powder compound(s) with mineral or rose water making a liquid paste and apply on the face, neck, and body. The skin is the body's largest organ and these compounds will detoxify and rejuvenate through the skin, cells, and blood system. Herbal compound treatments should be rinsed off with cold water after 10- to 30 minutes for optimum results. the Queen of Fruits for its delicious sweet white fruit but it is in the bitter tasting pericarp (rind) where the greatest value abides. Sun-dried pericarp yield the highest tannin concentration of 5.5%.  Highest content of Xanthones from the fresh fruit pericarp (rind). Mangosteen has long been used in Asia for its powerful anti-inflammatory properties and has been effectively used for treatment of various skin conditions as well as a traditional tonic for fatigue and low energy. There may be no other plant more widely used and studied in Asia that is so unfamiliar to the Western world. Mix Mangosteen pericarp botanical compound with mineral or rose water into a liquid paste and apply on the face, neck, and body (the body's largest organ) and the compounds will detoxify and rejuvenate topically via the skin, cells, and blood system. Moringa, "Miracle Tree, Horseradish Tree, Ben Oil Tree" is considered to be the most nutrient plant ever known to mankind. Moringa by nature has more than 90 different nutrients that our body can absorb and keep us healthy. 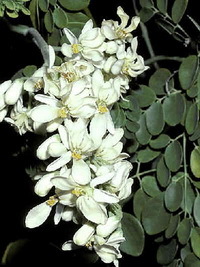 The Leaves, Flowers, Vegetables (Drum Stick), Seeds of the moringa trees are commonly used in human life. The main source from Moringa are as follows Vitamins: Vitamin A (Beta Carotene), Vitamin B1 (Thiamine), Vitamin B2 (Riboflavin), Vitamin B3 (Niacin), Vitamin B6 Pyrodixine), Vitamin B7 (Biotin), Vitamin C (Ascorbic Acid), Vitamin D (Cholecalciferol), Vitamin E (Tocopherol) and Vitamin K. Minerals: Moringa is abundant in minerals that includes Calcium, Iron, Potassium, Magnesium, Manganese and Zinc. Moringa is the richest source of Calcium from a plant material and Moringa has 17 times more Calcium than that of milk. Moringa, with 25 times more Iron than that of Spinach, helps in the formation of hemoglobin and myoglobin. The proteins in Moringa Tea gives 18 of the 20 known amino acids, including all eight amino acids classified as essential. These essential amino acids cannot be synthesized by the body and must come from a persons diet, usually from red meat or dairy products. These foods are not available in many parts of the world and are lacking in the diets of vegetarians, elderly people, and children. Moringa, with its 90+ verifiable nutrients, not only contains all these elements, but also has significant portions of Vitamins B, B1, B2, B3, D, and E, polyphenols (antioxidants), other minerals, fiber, and is one of the highest, naturally occurring sources of chlorophyll. Antioxidants: Moringa has approximately 46 antioxidants and is one of the most powerful sources of natural anti-oxidants. The major anti-oxidants present are Quercetin, Kaempferol, Beta-Sitosterol, Caffeoylquinic acid and Zeatin. Moringa with 15 times the potassium in Banana, assists in the regulation of the acid-base and water balance in the blood and the body tissues. Phaohom in Thai language loosely translates to "red galanga" rhizome in English. The herb contains about 2.5 to 4% essential oil. Praohom is a strongly aromatic natural herb similar to ginger that is used in Auyervedic holistic and homeopathic medicine practice and spa massage body scrubs and face masks. Resembling ginger in it's appearance and effects, galangal is an aromatic stimulant, carminative and stomachic used for relief of rheumatism and possesses tonic and superb antibacterial qualities. It is renowned in holistic health as an exceptionally emollient skin moisterizer that has a softening and soothing stimulating effect. In India it's called Kulanjan and used as an herbal body deodorant. The main components derived from the rhizome are ethyl cinnamate (25%), ethyl-p-methoxycinnamate (30%) and p-methoxycinnamic acid; furthermore, 3-carene-5-one was found. (Phytochemistry, 26, 3350, 1987). Both Kaempferia galangal and the Greater Galangal herbs s have been in use throughout Europe and Asia a tonic and aphrodisiac for centuries. Galangal has been known in the west for hundreds of years to native Americans for its stimulant and tonic properties, and is claimed to reduce fever and indigestion. Tibetan incense makers use red galanga in formulas to elevate awareness, overcome physical exhaustion, and create a mood for contemplation. Phaohom/Krachai is a strongly exotic aromatic yet this naturally potent species of the herb is used in holistic spa massage practice in body scrubs, skin care and face masks as a mild stimulant and vasorelaxant. It is used to treat rheumatism and possesses tonic and antibacterial qualities when used in holistic & homeopathic medicine. Galanga has been known in the west for hundreds of years among native American Indians for its stimulant and tonic properties, and was claimed to reduce fever and indigestion. Tibetan incense makers use red Kaempferia galangal in formulas to elevate awareness, overcome physical exhaustion, and create a mood for contemplation. Plai, Zingiber cassumunar Roxb., which is synonymous with Zingiber purpureum Roscoe, has long been regarded by Thai massage therapists as one of those compounds/oils necessary to have in their kit to combat joint and muscle problems. Plai is of the same family as ginger (Zingiber officinale Roscoe) but has different properties and more intense actions. Makham pom benefits the circulatory system by purifying the blood, detoxifies the body, and strengthens the immune system. The fruit is a very rich source of vitamin C according to most if not nearly all references, this is probably not the case [Ghosal, 1996]. It was proposed that superior effect of the mistaken "vitamin C" component is actually the more stable and potent anti-oxidant effect of the tannins that appeared to be the vitamin. A repeated laboratory test showed that every 100g of fresh fruit provides 470 - 680mg of vitamin C. The vitamin value of Makham pom increased further when the juice was extracted from the fruit. The dehydrated berry provided 2428 - 3470mg of vitamin C per 100g. Its mineral and vitamin contents include calcium, phosphorous, iron, carotene, thiamine, riboflavin, and niacin. The fruits, leaves and bark are rich in tannins. It has the following fatty acids: linolenic (8.8%), linoleic (44.0%), oleic (28.4%), stearic (2.15%), palmitic (3.0%) and myristic (1.0%) [Thakur et al]. Photoaging of the skin is a complex biologic process affecting various layers of the skin with major changes seen in the connective tissue within the dermis. Emblica officinal was shown to reduce UV-induced erythema and had excellent free-radical quenching ability, chelating ability to iron and copper as well as MMP-1 and MMP-3 inhibitory activity [Chaudhuri, Guttierez, and Serrar, 2003] Emblica officinalis and liver health. Reversal of hepatotoxin-induced pre-fibrogenic events by Emblica officinalis--a histological study. Indian J Exp Biol. 2007. Efficacy of a herbal Makham pom Emblica officinalis fruit has been evaluated against carbon tetrachloride and thioacetamide induced changes in rat liver. Chronic treatment of carbon tetrachloride and thioacetamide revealed abnormal histopathology indicative of pre-fibrogenic events. Emblica officinalis reversed such alterations with significant regenerative changes suggestive of its preventive role in prefibrogenesis of liver. Makham pom Emblica officinalis - Gaertn.attenuates age-related renal dysfunction by oxidative stress. J Agric Food Chem. 2007. To investigate the effects of Emblica officinalis on renal dysfunction involved in oxidative stress during the aging process, we employed young (2 months old) and aged (13 months old) male rats and administered SunAmla (Taiyo Kagaku Co., Ltd., Japan) or an ethyl acetate extract of Emblica officinalis, a polyphenol-rich fraction, at a dose of 40 or 10 mg/kg body weight/day for 100 days. The administration of SunAmla or EtOAc extract of Emblica officinalis reduced the elevated levels of serum creatinine and urea nitrogen in the aged rats. In addition, the tail arterial blood pressure was markedly elevated in aged control rats as compared with young rats, while the systolic blood pressure was significantly decreased by the administration of SunAmla or EtOAc extract of Emblica officinalis. Furthermore, the oral administration of SunAmla or EtOAc extract of Emblica officinalis significantly reduced thiobarbituric acid-reactive substance levels of serum, renal homogenate, and mitochondria in aged rats, suggesting that Emblica officinalis would ameliorate oxidative stress under aging. These results indicate that Emblica officinalis would be a very useful antioxidant for the prevention of age-related renal disease. 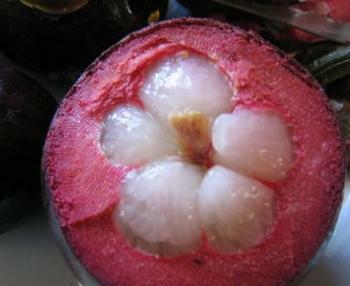 Makham pom contains Vitamin C, amino acids and minerals. The fruit contains protein and enriched with ascorbic acid, glutamic acid, proline, alanine, and lysine.They are available in 29.6%, 14.6%, 8.1%, 5.4% and 5.3% respectively. The pulpy portion of fruit (excluding nuts) contains gallic acid 1.32%, tannin, sugar 36.10%; gum 13.75%; albumin 13.08%; crude cellulose 17.08%; mineral matter 4.12% and moisture 3.83%. 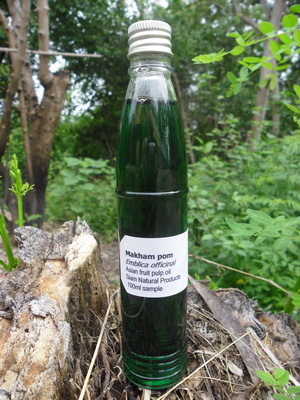 Makham pom fruit ash contains chromium, 2.5 ppm; zinc 4 ppm; and copper, 3 ppm. Main Active Components: Hexahydroxy-diphenic acid, Emblicanin ;B, Puniglucanin, Pedunculagin, 2-keto-gluconolactone (Vitamin-C equivalents)and Ellagic acid. 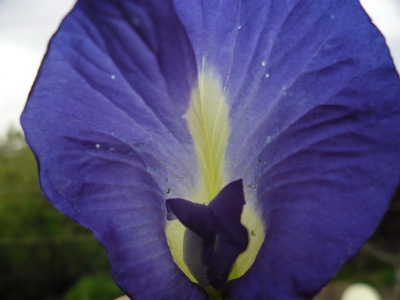 Siam Natural Makham pom fruit oil extract contains 2% Thai Anchan anthocyanin rich butterfly pea flower liquid extract formulated for oily skin. Rice Bran Oil derived from a Jasmine strain of Oryza sativa from north Thailand has been used in Thai holistic massage for it's rich brown outer layer of the rice kernel for generations. Rice bran is naturally rich in oils and makes an effective exfoliant. It also contains phytic acid, a B-complex* vitamin that can help improve blood circulation and stimulate cell turnover when used topically. Short grain (aka:sativa glutinosa sticky rice) rice bran contains a highly concentrated natural form of vitimin E molecule (i.e tocotrienol with 585 TRF mg per 1000 grams* / ppm tocotrienol) content. This highly anti-oxidant brown rice bran makes an effective exfoliant, and contains phytic acid, a B-complex vitamin that can help improve blood circulation and stimulate cell turnover when used topically. Jasmine Rice Bran Germ Oil Face & Body Conditioning Tonic with wild Butterfly Pea Flower liquid extract with natural anthocyanins (flavonoids) antioxidants . The combination of cold pressed Jasmine Rice Bran Oil with Thai Butterfly Pea Flower is great for overall good health, new hair growth & conditioning, skin & scalp revitalizing treatments, & blood rejuvenation. Recommended for prevention of diabetes related ailments such as glaucoma, cateracts & several skin disorders. Jasmine herbal cold pressed Rice Bran Germ Oil with Butterfly Pea flower liquid extract neutralizes excess oils, targets premature aging, and clears & smoothes wrinkles . Jasmine Rice bran and germ oil contains numerous minerals & nutrients such as Chromium, Magnesium, Zinc, Selenium, Iron, Potassium which promote healthy heart function, nervous system, brain system, reproductive system, along with many other physical benefits such as skin toning and stimulating the Circulatory System. A general step is to consume plenty of foods rich in flavonoids, the water-soluble pigments that give plants their color. These compounds tone skin protect from inflammation and oxidative damage and help revive the circulatory system to get back years of health and glow. Illnesses of the Heart, Veins, Arteries, Blood, Lymphatic system are all dependent on the overall vitality and balance of the circulatory system. Unsightly varicose veins are a condition of the lower legs that occur when the cirulatory system is unable to keep up with carrying blood back to the heart. When vein walls get weak, blood leaks out or flows in the wrong direction. Several studies have shown a mixture of citrus bioflavonoids called rutosides to be helpful in treating varicose veins. A general step is to increase fiber in the diet consume plenty of foods rich in flavonoids, the water-soluble pigments that give plants their color. These compounds tone veins and protect them from inflammation and oxidative damage. Varicose Veins in the lower legs that are unable to keep up with carrying blood back to the heart and when vein walls get weak, blood leaks out or flows in the wrong direction. Several studies have shown a mixture of citrus bioflavonoids called rutosides to be helpful in treating varicose veins. Reviving the circulatory system back to health. the circulatory system. Researchers have conducted studies on the use of bioflavonoids for the treatment of poor circulation. In one eight-week study, researchers gave the subjects  gram of citrus bioflavonoids per day. At the end of the study, subjects reported better mobility during the day; improved stamina; and the regression of pain, nocturnal cramps, and fullness. * ProVitamin A can help with skin integrity and speed varicose ulcer healing. * Vitamin E can help to improve circulation, reduce the susceptibility to varicose veins, and relieve pain. Embark on a use basic exercise routine such as walking and swimming, or gentle leg muscle stretches. read the PDF Anthocyanins in Cardiovascular Disease Taylor C. Wallace Recent studies on the CVD preventative activities of anthocyanins, including results from in vitro cell culture and in vivo animal model systems as well as data from human epidemiological studies, are presented. Current knowledge of the bioavailability of anthocyanins as well as their breakdown products and metabolites is also presented. Many in vitro laboratory studies provide insight on the multiple mechanisms by which anthocyanins may help maintain a healthy vascular system. The abundance of in vivo animal and human studies is low; furthermore, the relevance of the high concentrations of anthocyanins used in many in vitro studies as related to the in vivo situation needs to be confirmed. Thus, anthocyanin-enhanced extracts produce endothelium-dependent relaxation in porcine coronary arteries. Extract concentrations too low to directly alter coronary vascular tone protect coronary arteries from ROS without altering vasorelaxation to endogenous or exogenous NO. These results suggest that such extracts could have significant beneficial effects in vascular disease. Cold pressed Jasmine Rice Bran Oil with Thai wild Butterfly Pea 'Anchan' flower liquid extract is a natural anti-aging skin, scalp and circulatory system stimulent nutriment oil tonic. Ayurveda - (Sanskrit) is an ancient medical treatise summarizing the Hindu art of healing and prolonging life. "Think of your beauty products not as cosmetics, but as food for the skin," says Pratima Raichur, Director of the Pratima Ayurvedic Skin Care Center in New York City. Underlying Raichur's philosophy is Ayurveda, the ancient Indian science that emphasizes the benefits of natural ingredients in healing and balancing the body.